Flairco is proud to announce the creation of the new Bartending Arts and Sciences courses, taught by some of the biggest names in flair bartending. Our internationally renowned mixologists and flair bartenders are looking to pass along their years of experience behind the bar in this showmanship and cocktail program designed specifically for professional bartenders. This program combines practical working flair skills with in depth knowledge of the history and flavours of the spirits behind the bar. Together, these elements will help professional bartenders impress their existing clientele and add more regular guests. Upon completing this program, bartenders will be able to increase profits and gratuities behind the bar by creating their own specialty cocktails to answer that age old guest response “I am not sure what I want” with astounding results. New to the program this year is the inclusion of cocktail menu design and more advanced “showstopper” tricks that will generate attention and spark conversation. 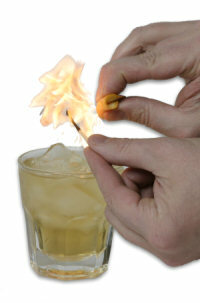 The Bartending Arts and Sciences program is taught over the course of two days, depending on our instructor's schedule. Included are a Flairco practice bottle and a 28oz shaker tin, plus all of the bottles, mixes and supplies needed by students to participate in the program. Students scoring over 90% on their final exam will be added to the Dean’s List! Be sure to read the testimonials posted from some of our past students. The Flairco Bartending Arts and Sciences programs are reserved for experienced bartenders. They are not entry level bartender training programs. All students must have proof of time spent working in the hospitality industry to qualify. The bare minimum eligibility includes recent graduation from a reputable bartending school. We reserve the right to deny entry to this program if the eligibility requirements are not met. To register for either course, please contact the program administrator at the Flairco Offices. Payment is due prior to the actual course dates and can be made by Visa, Master Card, American Express, cash, money order or certified cheque.